Foie Gras has its own rituals. It can be enjoyed as is. But there are certain flavours for which Foie Gras has a clear preference. Freshly baked or lightly toasted country bread and toasted sandwich bread have rightly become great favourites. But also : Traditional baguettes or even wholemeal baguettes which are all the rage at the moment, Poilâne-style sourdough bread is also a popular accompaniment for Foie Gras. Fruit bread is worth a try ! 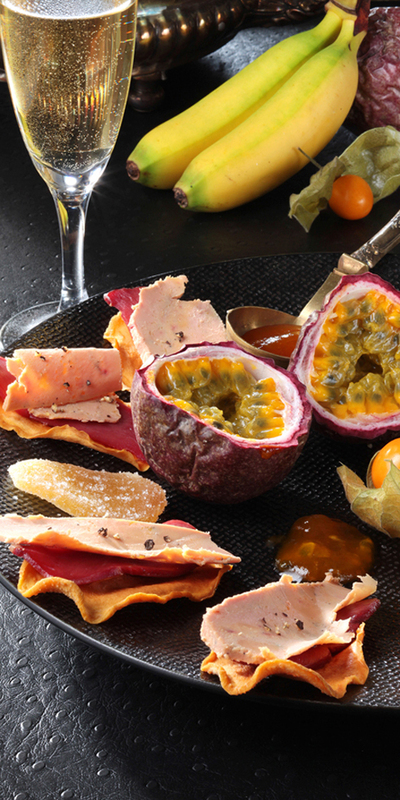 Try a piece of Foie Gras on a slice of lightly toasted fruit bread. You'll find the combination of sweet and savoury flavours utterly irresistible. To fully appreciate the flavour of Foie Gras melt-in-the-mouth, try it on toast. 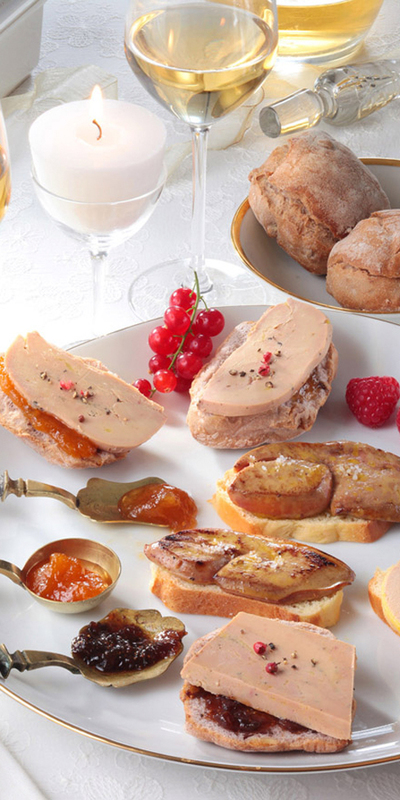 There are few wine-food comibinations as sublime as Foie Gras and its wide variety of matching crus. Foie Gras and a sweet syrupy wine such as Sauternes is simply exquisite. All the wines of southwest France such as Jurançon or Monbazillac, sweet Bergerac, a pungent Loupiac, or a Sainte-Croix-du-Mont bring out the best in Foie Gras. The Cercle des Amoureux du Foie Gras (association of Foie Gras lovers) recommends these wines. The finest red wine crus also go well with Foie Gras , bringing out its delicate flavouring: the best crus of Médoc (Margaux, Pauillac), crus of Libournais (Pomerol) and even the even the tannic Madiran and Cahors. 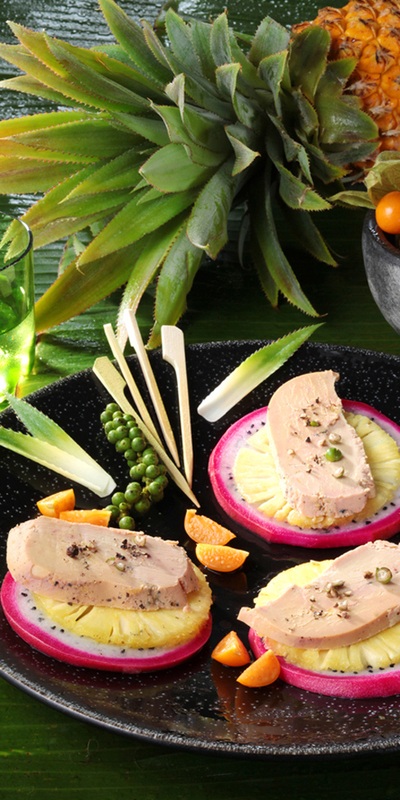 Champagne is a recent partner for Foie Gras but has already won over many enthusiasts. Finding it hard to decide ? There is one essential condition: the wine must have a certain complexity and a fine bouquet. Wines which are overly light, acidic or simply too young should be avoided since they prevent the full aromas of the Foie Gras from developing. This combination of fine products is a sheer delight. The variations are multiple and always delicious provided these few principles are adhered to. "Truffles, wherever you go, it's truffles. They are nothing less than the fragrant soul of Périgord !" exclaimed Curnonsky. This rarest of mushrooms is the traditional accompaniment for Foie Gras, particularly the goose variety. But truffles also go perfectly with duck Foie Gras. When Foie Gras is "truffled", as the law would have it, a minimum truffle content of 3% is required. Truffled at X % signifies that the truffle content is between 1 and 3%. Foie Gras can also be presented on a serving dish surrounded by diced aspic, dried fruit compote, black cherry jam, fresh figs, gooseberries, white grapes. Give full rein to your imagination. 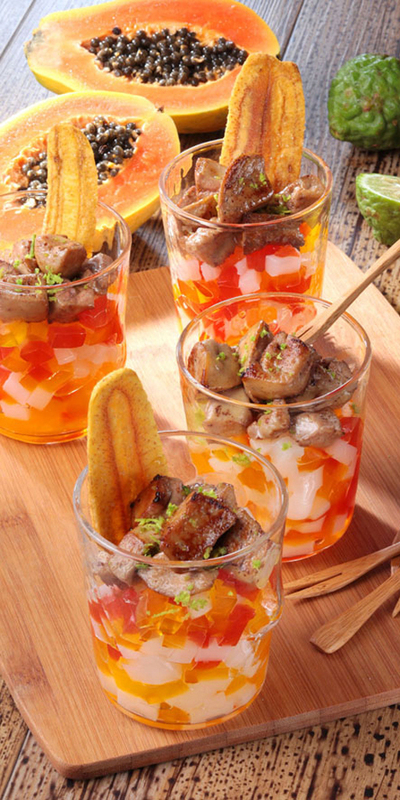 Foie Gras likes nothing better than a touch of inspiration. A final tip from those in the know: avoid salads with too much mustard or vinegar dressing. Foie Gras reacts badly to bitter or overly strong flavours. Give Foie Gras top billing.